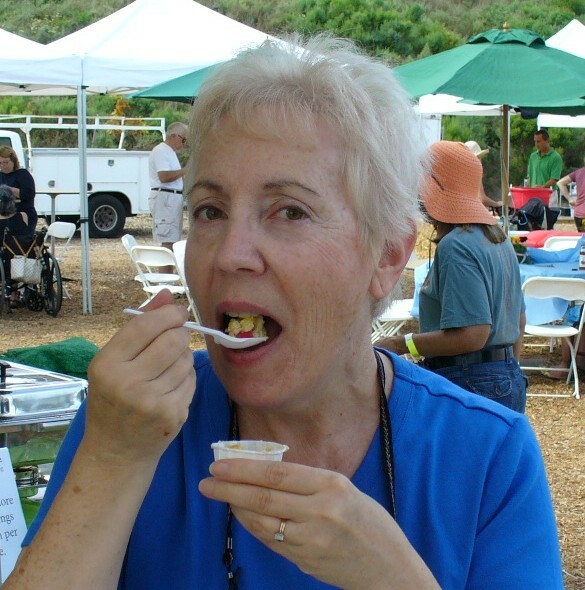 Looking for results from the San Diego County Fair cooking contests? I’ve got some here for you — results from the Great American Spam championship (held June 8) and also the Kids’ Contest (held June 23). 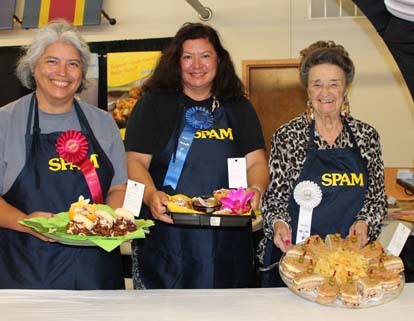 The adult winner was Monica Bennett of San Diego, who won $150 for her Spammy Cristo Minis and a chance to move on to the nationals, where she will compete for a trip to Hawaii. Not too bad for a Spam sandwich with a twist! Also winning prizes were Lucia Yandell of San Diego for her Pulled “Spork” Sandwiches, and Alberta Dunbar of San Diego for her Sir Spamalots Club Spamwich. Winners in the Kids’ Division were Katie Russell, 11, of Oceanside for her Tropical Spamwitch, Colin San Nicolas, 8, Oceanside for his Spamtassium, and Noah Tang, 8, San Diego, for his Spambled Egg Sandwich. For Belgian waffles: Thoroughly combine pancake baking mix, buttermilk, vegetable oil and 1 egg in mixing bowl. Add approximately 1/4 cup waffle mix into a preheated waffle maker. Cook waffles until golden brown. Place waffles on a serving plate to cool. Yields about 4 waffles. For Cream Cheese Mixture: Chop sweet pickled ginger and unsweetened pineapple. In mixing bowl, combine chopped pineapple and ginger with the two packages of softened cream cheese. Mix Chinese five spice powder into cream cheese mixture. Prepare Spam: Thinly slice one can of Spam Classic. Place Spam in frying pan and cook over low flame until Spam is crispy on surface. Sprinkle with seasoned pepper. Place Spam on serving plate to cool. For Batter Coating: Place 1 egg, water, salt, sugar and flour in a mixing bowl. Thoroughly blend ingredients. Assemble: Starting with 1 waffle, spread waffles with cream cheese mixture. Place 1 slice of Spam on each waffle quarter. Place second waffle, with cream cheese side facing inward, on top of first waffle. Slice waffle into quarters. Slice quarter pieces in half. Secure each corner of the Spammy Cristo Mini with a long toothpick. Continue process until all waffles have been prepared. Fill a small saucepan with at least 3 inches of vegetable oil. Make sure the oil line is at least 3 inches away from the rim of the pan. Heat oil with a low to medium flame until oil temperature is approximately 350 degrees. Prepare a tray with several layers of paper towels. Using tongs, dip one Cristo Mini in batter coating, then lower it into the oil. Cook Cristo Mini until coating is golden brown. Using tongs, remove mini from pan and allow it to cool on prepared tray. Sprinkle Cristo Mini with powdered sugar. Repeat until all the minis have been cooked. Serve with raspberry jelly garnish. Butter the slices of bread and put in a toaster oven until lightly browned. Saute onion in olive oil until golden brown. In a bowl, mix mayonnaise with lime and orange zest. Set aside. Stir together juice of 1 lime with 1/3 cup water. Add honey, salt and ginger. Pour honey mixture over sliced mango and cucumber. Let sit for 5 minutes. To make sandwich, spread mayo mixture on inside of bread, top with onions, sliced SPAM, cucumber, mango, avocado and other slice of bread. Enjoy! Woke up this morning — and heard the sad news about James Gandolfini’s death. He did a tremendous job as Tony Soprano, which is how most people knew him and will remember him, though the actor distinguished himself with many other parts in TV, plays and movies after that landmark HBO series. I can’t do a recap of Gandolfini’s life and career — I’ll leave that to the entertainment writers — but his passing made me think back fondly on “The Sopranos” and the many surprises, shocks and suspense-filled moments it offered viewers during its run. In 1999, a friend in the HBO publicity department sent me the first four episodes of “The Sopranos” before it aired. “You’re Italian,” she said. “Tell me if you’re offended.” After watching just two episodes, I told her I loved it and couldn’t wait to see the rest. Thus began a Sunday-night ritual that lasted until 2007. — Livia sets the kitchen on fire, thus precipitating her move to a nursing home and her ordering a hit on son Tony in revenge. — Hotheaded Chris Moltisanti shoots a slow-moving bakery store clerk in the foot, a nod by the writers to actor Michael Imperioli’s role in “Goodfellas,” in which he is shot in the foot by Joe Pesci. — The many meals enjoyed at gangster wannabe Artie Bucco’s new restaurant, after his previous one was torched to prevent a mob hit that would have hurt future business. — And the many sub sandwiches “brought in” by the guys to their offices at the Bada Bing club. — The immortal line, “So what, no f—in’ ziti now?” uttered by young A.J. Soprano when he learns his grandmother isn’t coming to a family barbecue. — Carmela Soprano’s lasagna, passed off by Tony’s sister Janice as her own in order to impress lonesome widower Bobby Baccala. — The ricotta pie, one of the most effective weapons used in the show. Carmela offered the pie to an acquaintance who was unwilling to write a recommendation letter for daughter Meadow’s college application. Carmela made it oh-so-clear that the request, like the pie, was not to be denied. — And of course, the final scenes, which took place in a diner as the family munched on onion rings before the hotly argued blackout ending. In that last episode, A.J. reminded Tony of some advice he once offered him: “Remember the good times.” I’m sad at the too-early passing of a fine actor, but glad for the memories he gave us. Preheat oven to 350 degrees. Spread butter over bottom and sides of a 9-inch pie pan or springform pan. Add crumbs, turning pan to coat bottom and sides. In large bowl, stir together the sugar and cornstarch. Add ricotta, eggs, cream, lemon zest and vanilla, and beat until smooth. Pour mixture into the prepared pan. Bake for 50 minutes, or until pie is set around the edges but center is still slightly soft. Cool to room temperature on wire rack. To make topping: Drain pineapple well, reserving 1/2 cup liquid. In a medium saucepan, stir together the sugar and cornstarch. Stir in the 1/2 cup pineapple juice and the lemon juice. Cook, stirring, until thickened, about 1 minute. Add the pineapple. Remove from the heat and let cool slightly. Spread pineapple mixture over pie. Cover and chill for at least 1 hour before serving. Serves 8. Notes: I used 1/2 cup skim milk instead of the 1/2 cup cream in this recipe to lighten it a bit, and it came out great. I think a blueberry topping would also be great on this. I was a young reporter on my first job in the Indiana heartland. My beat was education, but also general assignment, which on a small-town daily paper meant I could write about pretty much anything I wanted. But we were in the county seat, so when the annual county fair came around, all of us did fair stories. Born and bred in New York City, I didn’t know much about county fairs. Midway games, rides, cotton candy, oh, and something to do with livestock. My co-workers rapidly brought me up to speed on 4-H and the many different contests that were integral parts of the fair. When someone explained the food competitions, a little spark went off. “Why don’t I compete? City slicker vs. the home folks. It could be fun,” I volunteered. My boss agreed. Looking over the contest categories, I was disappointed to see that there was no category for eggplant parmigiana, one of my specialties at the time. OK, I’d enter something else. Canning? No. Preserves? Nope. Baking? THAT I could do. I chose banana bread, which had its own category. I had made banana bread before, and it had turned out fine. How hard, really, could this cooking competition stuff be? Maybe I’d enter a few other categories, too, like apple pie and brownies, and take home a pile of ribbons. But time got away from me, and the night before the competition, I completed only one item, the banana nut bread. The recipe was from my lone cookbook at the time, a paperback Fannie Farmer. And the bread turned out just fine, a burnished brown block of banana goodness. I brought it to the fairgrounds as a contestant that morning, and returned later in the day as a reporter to observe behind the scenes of the baked-goods judging. The judge was a slim young woman named Dee Ann Cabell, a 10-year 4-H member at the time who had majored in home economics at Purdue University. She had been judging at fairs for about seven years, doing about six fairs a year. And she knew her stuff. Next came the crescent dinner rolls, several to a plate. Cabell addressed the first entry. The end point of one roll was too short; another curled below the roll’s bottom. “These are not uniform,” she noted. “Also, there’s too much flour on the bottom.” Another roll was chided for its uneven size and browning. That’s when I realized that my banana bread and I were in trouble. What the city slicker hadn’t known was that there were standards governing what made a prize-winning dinner roll, a perfect pie crust. To enter the brownie category, for example, you had to submit six. They had to meet the criteria of the category (not too tall! not too pale! not too airy! ), and they had to be identical in shape, size and color. Taste was just one factor among many. Clearly, my bread and I had been knocked out of the running. “At least it didn’t make her sick,” I muttered to Carol Evans, general chairwoman of the Women’s Exhibits. “Give it time to reach her stomach,” Evans said dryly. Cabell worked her way through 117 entries that day over four hours, and not only didn’t she get sick, she said she’d never been made ill by a fair entry. She tried to say something positive about every entry (see above), and even if something looked awful, she said, she ate some of it, because it would be “really insulting” if she didn’t. Though my banana bread hadn’t measured up to those of much more experienced cooks, the story turned out well and my boss was pleased. And I had been soundly educated by these modest farm women. What looked so deceptively simple turned out to have depths and nuances I had never even considered in my youthful arrogance. I did compete again at subsequent county fairs, but not in the culinary division. I planted a big garden the next summer, and won blue ribbons (yes, I did!) for my six uniform green beans and my three identical bell peppers. But I still wish I’d been able to enter that eggplant parmigiana. Here’s the Fannie Farmer recipe I used for my fair entry. Just remember to mash those bananas thoroughly! Stir well. Put in a buttered loaf pan 9 by 5 inches. Bake 1 hour at 350 degrees. Note: Some like to add 2 tablespoons melted butter to the batter. Above: My blanched brussels sprouts, ready for patting dry and freezing. I admit I’m one of those people who regularly prowl supermarket “clearance” racks. When I find something I can use that’s been marked down, it’s like hitting triple 7s at the slots. At the market last weekend, I spotted two packages of brussels sprouts, each 24 ounces, both marked to half price, $1.99. (If you don’t happen to be a fan of brussels sprouts, please keep reading, as this will work with other vegetables.) Three pounds for $4, not bad. Into the cart they went. I didn’t want to cook them all at once and live off brussels sprouts all week, so I decided to freeze them for future use. To do this, I would need to blanch them first. Blanching means cooking the vegetables briefly, then stopping the cooking. Why not just toss the bags of sprouts into the freezer? According to my Better Homes and Gardens cookbook, the precooking stops the action of an enzyme that would otherwise make the vegetables deteriorate. With blanching, they’ll hold better in the freezer. 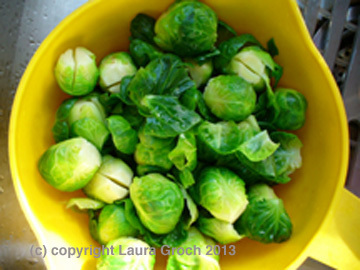 Once I got them home, the sprouts went into the sink for an inspection and a wash while a big pot of water came to the boil on the stove. I trimmed off the ends and put a vertical cut (some people do an “X”) into the sprout bottom, about a quarter-inch deep, for more even cooking when they come out of the freezer. Another pot of cold water was waiting in the sink. Once the water boiled, I put in a couple of handfuls of sprouts, let them boil for a couple of minutes, then scooped them out and plunged them into the cold water. (For best results, use ice water, and refresh it as the ice melts.) Then I drained them, spread them on a paper towel and blotted them dry a bit. Once all the sprouts were done and cooled off, I portioned them into freezer bags, sealed them and patted them flat, then stacked them in the freezer for future use. It’s pretty easy, and I love when saving money is easy. ;<) Check your cookbooks or the Internet for blanching times recommended for different vegetables — they can vary from 3 to 5 minutes, depending on the veggie and the size of the pieces you’ve cut it into. It’s also good to consult an expert source about which vegetables need this technique and which ones don’t. Some vegetables, like onions and peppers, don’t need blanching — just wash, blot dry, and freeze. The National Center for Home Food Preservation has lots of good information and a chart of various veggies and times.